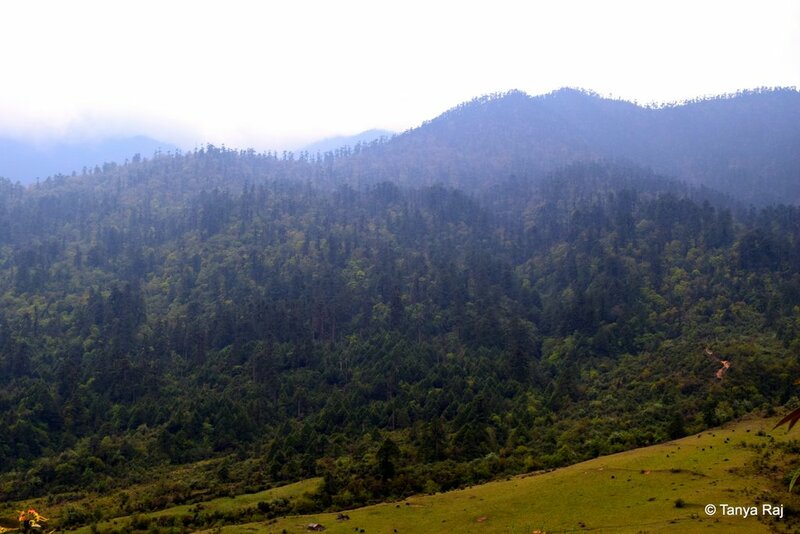 The Land Of The Thundering Dragon (Druk Yul) that is what Bhutan calls itself, and it is anything but that. The name is derived from the strong gales that howl throughout this mountainous region, and yet in a dichotomy to its name, it is one of the calmest, serene, and most peaceful places I have ever visited. 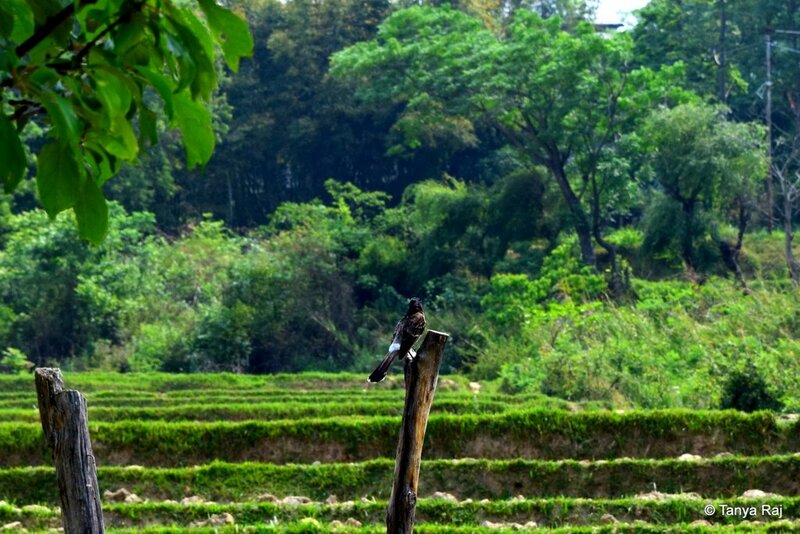 The country prides itself as being carbon negative and as mandated by law, 60% of its area always needs to be forested. 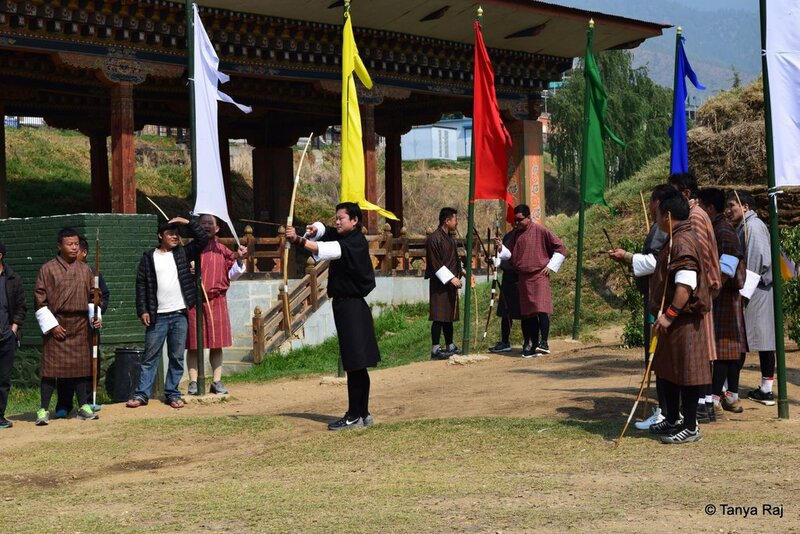 Their commitment to being connected to nature was recently also evident when the Druk Gyalpo (Dragon King) – Jigme Khesar Namgyal Wangchuk – and Druk Gyaltsuen (Dragon Queen) – Jetsun Pema Wangchuk – celebrated the arrival of their newborn in a unique way. 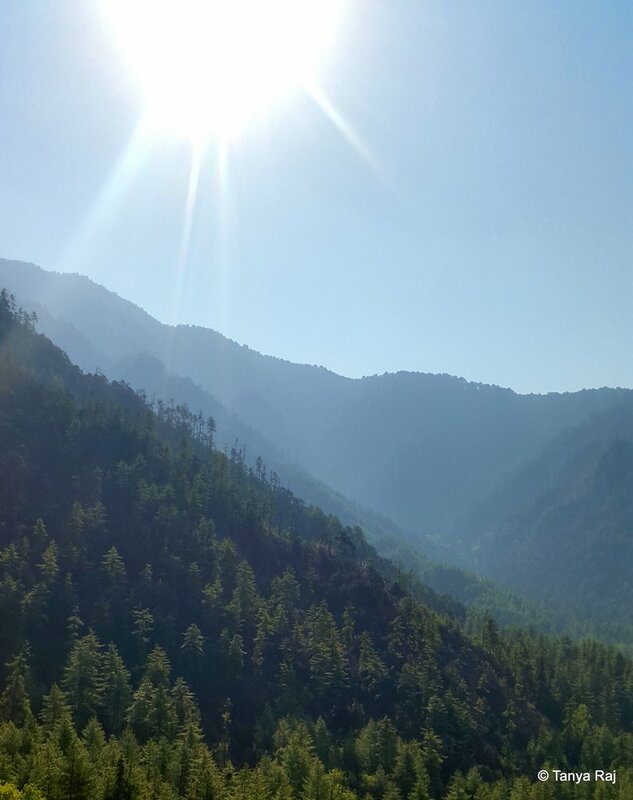 Valley views on the drive from Thimphu to Bumthang. 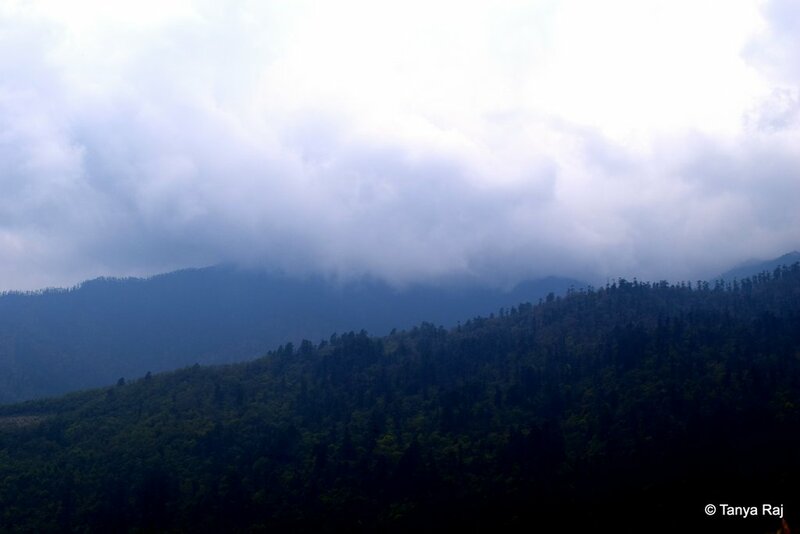 The clean mountain air and greenery are a soothing experience for the mind, body, and soul. 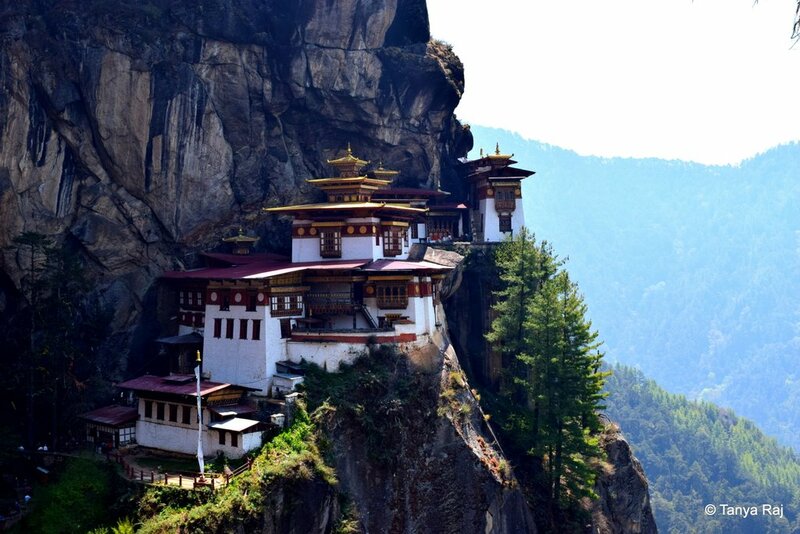 I journeyed with Exotic Expeditions and of the many memorable moments from this 10-day trip, one that stands out is the hike up to Taktsang Palphug – Tiger’s Nest Monastery at Paro. The drive to the base of the hike went through winding valley roads covered on each side by tall conifer trees. At the base after picking up our walking sticks, we started the steep ascent to the monastery which hangs precariously on a cliffside, some 10,240-feet above Paro Valley. The entire trek is only about 8 kilometres but took us 3 hours to reach the summit as the climb is almost vertical in 80% of the trail, which consists of gravel, dried earth, and wind-polished boulders. The views throughout the trail are an ocean of rolling emerald green mountains layered in dense vegetation of conifers on one side and jagged cliffs on the other. At the breakfast stop on our way to the base of the hiking trail, with tall conifer trees surrounding the roads. Taktshang looks like a white blob on the mountain side at the start of the base. 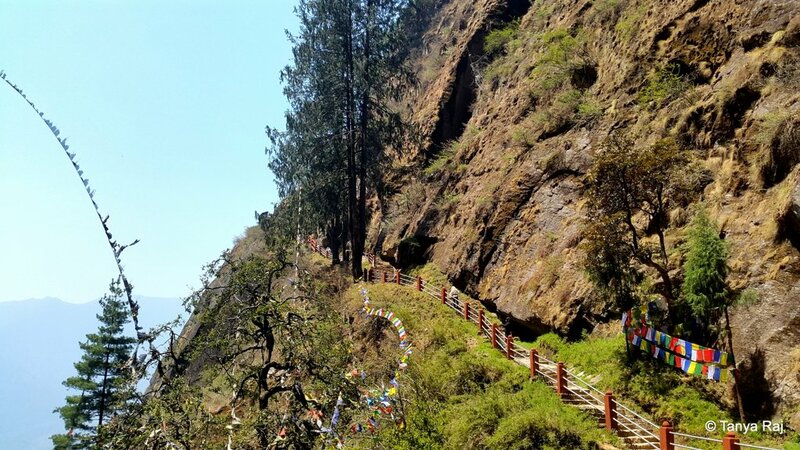 Legend has it that Guru Rinpoche (Padmasambhava) an incarnation of Gautama Buddha flew to this cliff on the back of a tigress from Tibet in order to defeat a local demon during the 8th century. He meditated for three years, three months, three weeks, three days and three hours on this cliff where the monastery today stands. Post the meditation he emerged in eight incarnated manifestations and since then this place is considered holy. Every turn of this trail welcomes you with one breathtaking view after another. On reaching the final look out to the monastery, about 800 small precipitous steps lead down the steep adjacent mountain to a bridge which connects to the main mountain where the monastery is located. A waterfall connects both mountains at the confluence, the roar of which mixed with the howling winds of the valley can be heard even from the café located at the mid-point of the trek. 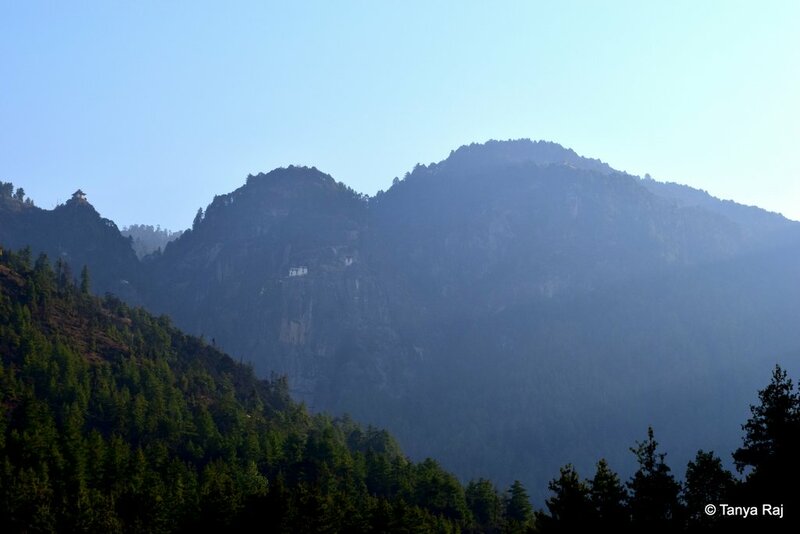 View of the Taktsang Palphug from the cafe located at midpoint of the hike. From the bridge, it is another climb of about 100 steps to reach the 9-temple complex on the cliff. Each temple inside the monastery is dedicated to a different energy. The walls of the monastery are covered in organic colour paintings of Compassion Buddha. A flight of almost vertical wooden stairs leads us down to the main temple where there is a 5-feet tall statue of Guru Rinpoche in a seated posture. This statue is known as the ‘Talking Guru’. According to legend, there are 3 similar statues of the Guru in Bhutan. While carrying this particular statue to the Dzong (monastery), at the final descent of the 800 stairs, due to the cumbersomeness of the statue, the workers decided to dismantle it for ease of carrying it up to the monastery. It is then when the statue spoke and instructed the workers not to do so and assured them that they will receive help. When night fell, the workers put up camp and slept near the statue. On waking up in the morning, they were surprised to find it missing and found out that one of the local deities (Dakini) had already carried it up to the monastery. Tiger’s Nest Monastery from the final lookout point. From here the descent starts before reaching the bridge connecting to the main mountain. At another temple on the upper levels, there is an opening in the floor barricaded by ornate wooden railings. On peeping down we saw a cave that is said to be still in use by the monks of the monastery. Each year, few senior monks climb down this 60 meters deep cave and meditate here. It is called the Magic Triangular Tiger owing to its shape and is swathed in numerous white khatas and myriad currencies thrown in as offerings. The 800 steps descent on the cliffside before the final ascent to the monastery. From there we headed to the butter lamp room and lit a lamp with a prayer. 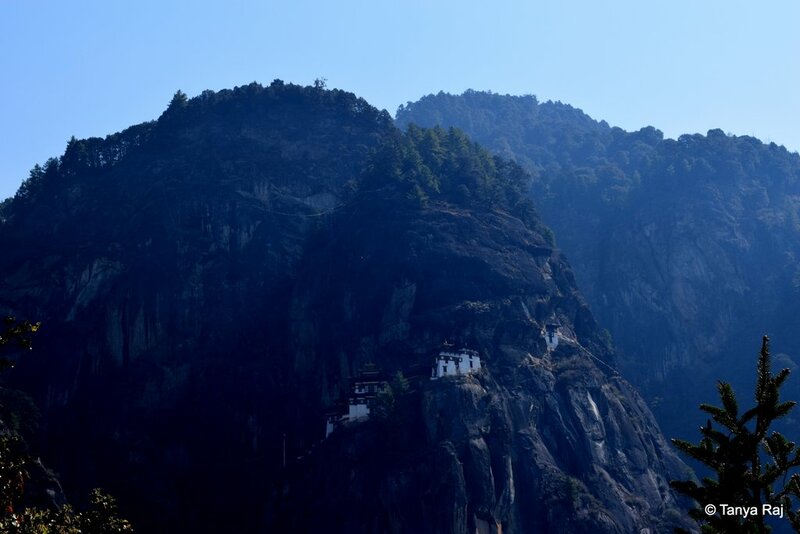 Next to this room, a flight of 10-12 steps led up to what is the actual Tiger’s Nest – the location where Guru Rinpoche landed on the tigress’ back. This cave like structure is narrow and the opening below gives a spectacular view of the cliffside and the valley below. Due to safety reasons, entry to this portion of the monastery is not allowed. To celebrate this legend, there is an annual dragon dance festival held in the streets of Paro, Punakha, Trashigang and Bumthang in the months of March-April each year. There are various vibrant festivals held all year round and a complete calendar is available online. The way back down the trail; tired in body but not in the scenic beauty. 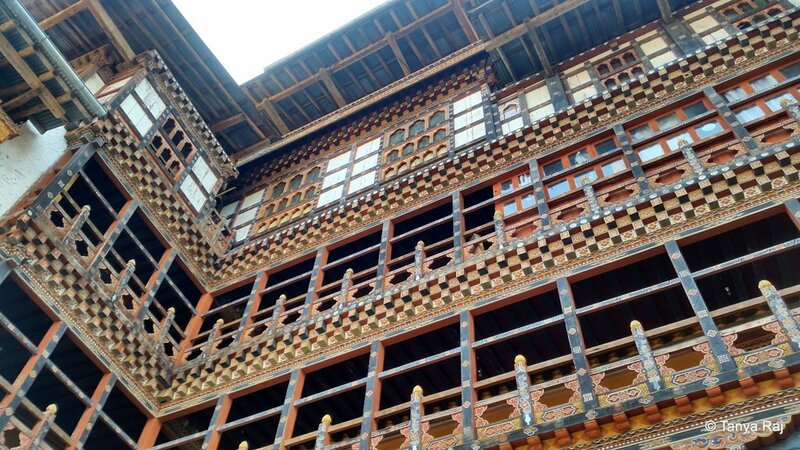 After Paro, we headed to Thimphu, the capital city of Bhutan. The drive throughout the country can be characterised as gushing rivers on the cliffside and deep blue-green mountains on the other. Every turn of the head greets one with one breathtaking view after another. 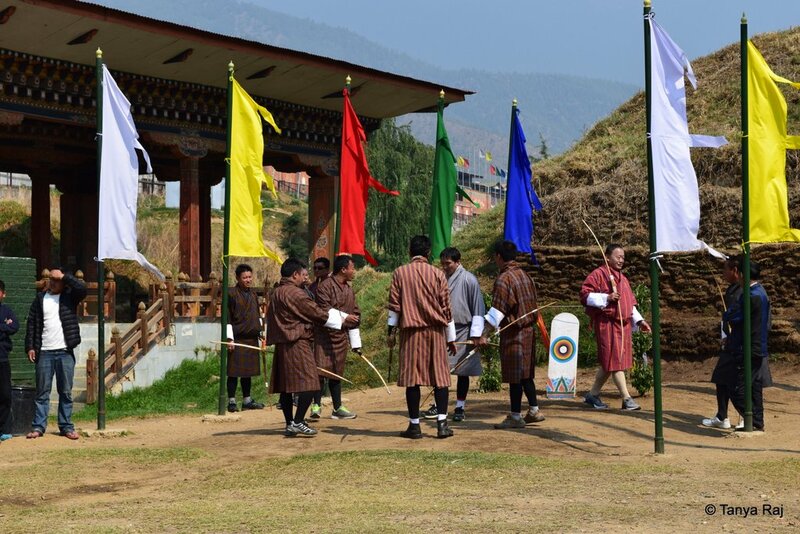 An early morning walk in the city led us to the Changlimithang stadium about 300 meters long, where two groups of men on either side, dressed in traditional Bhutanese garments were practising archery – the national game of Bhutan. The aim for each group was located on the other end of the field. Every time someone hit the target, the winning side would form a circle and sing folk songs while dancing to the tune before resuming position to aim again. The opposition on the other hand, continuously made a holler with teases and whistles to distract the person taking the aim. An archer taking aim at the Changlimithang Stadium, in the early hours of the day. The opposition on the other hand, continuously made a holler with teases and whistles to distract the person taking the aim. Every time someone hit the target, the winning side would form a circle and sing folk songs while dancing to the tune before resuming position to aim again. 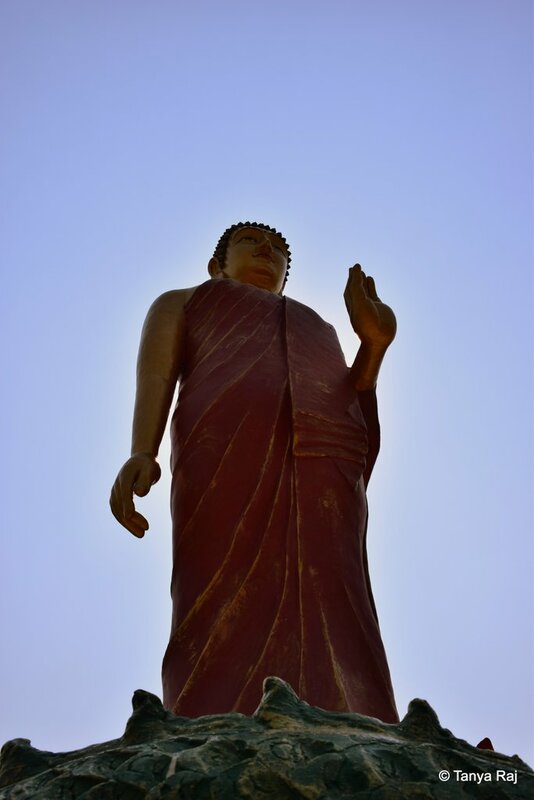 Opposite to the field, across the road, we walked into Coronation Park, where stands a 45-feet tall Walking Buddha statue. 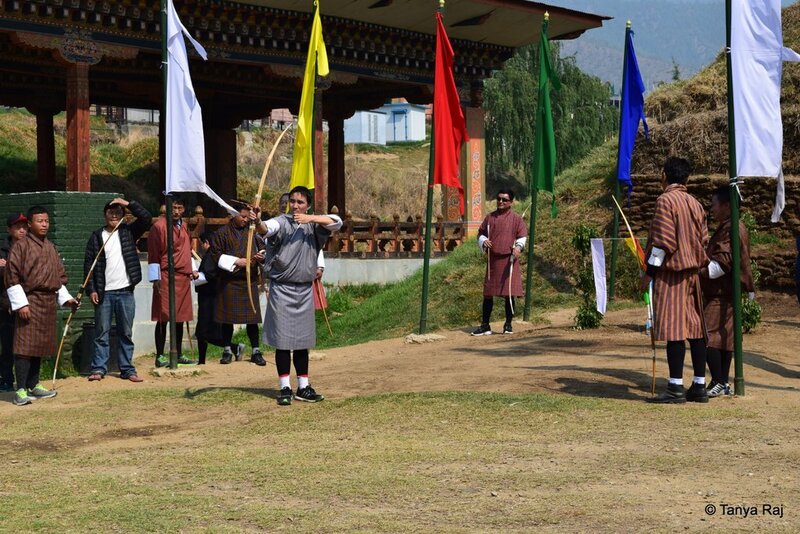 This park was inaugurated in 2006 in the honour of the coronation of the current Druk Gyalpo. Alongside the park runs the calm waters of Wangchu River. This river meets the Parochu River where the road diverts towards Paro and are considered river brothers. The Walking Buddha at Coronation Park, Thimphu. 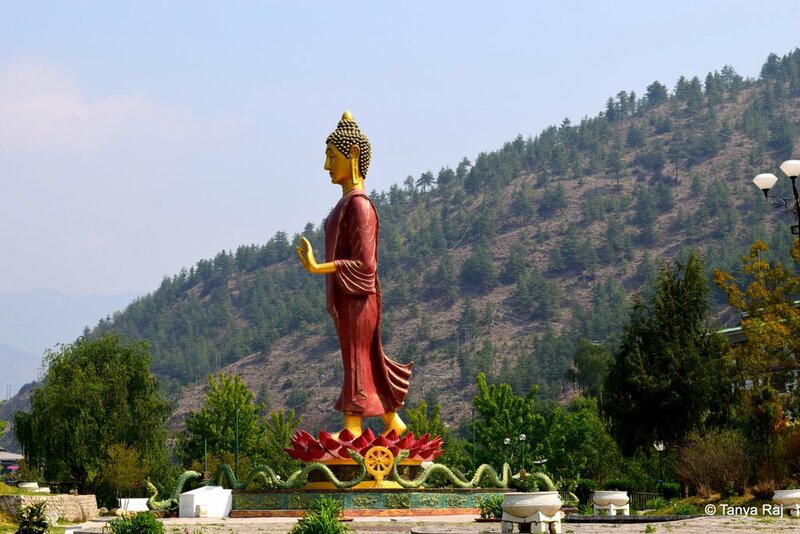 The park with The Walking Buddha statue is calm and serene, despite being in the midst of the city, with the waters of Wangchu River flowing alongside. Across the horizon, towards the south, atop a mountain, visible from every part of the city sits the Buddha Dordenma. This 169-feet tall statue of Shakyamuni Buddha atop a lotus sits above the sanctum sanctorum of the temple of Maitreya Buddha. Around the structure is a sprawling courtyard dotted with 108 Taras representing different energies. Buddha Dordenma, on the southern ridges of Thimphu City, adorns the sky. 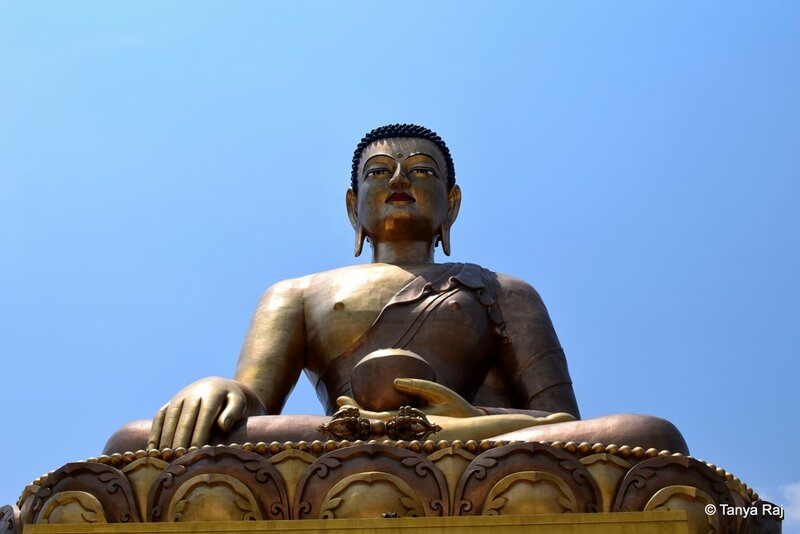 Buddha Dordenma is the Shakyamuni Buddha atop a golden lotus, sitting erect at 169-feet. 108 Tara statues adorn the expansive courtyard around the Buddha Dordenma. 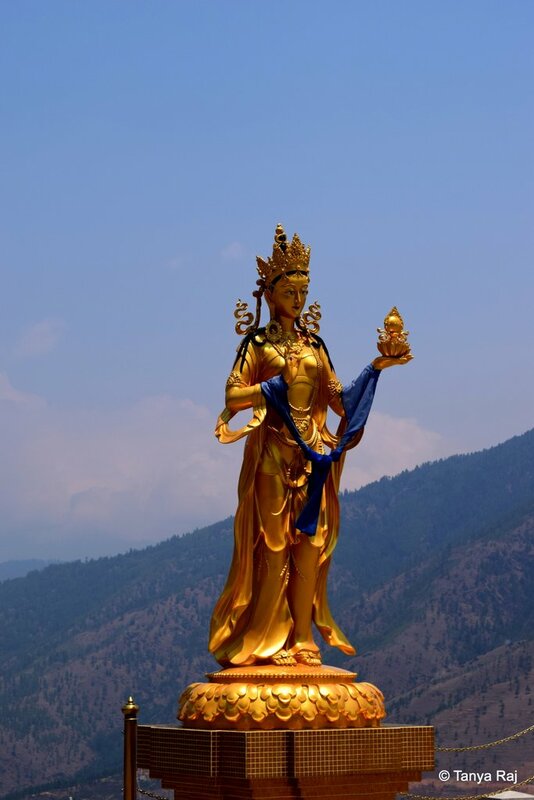 A single Tara statue, resplendent in blue finery, In Buddhism, the colour blue represents sky and sea, symbolising the infinity and the limitless heights of ascension. From here we head to the memorial on the Third Druk Gyalpo – Jigme Dorji Wangchuk. 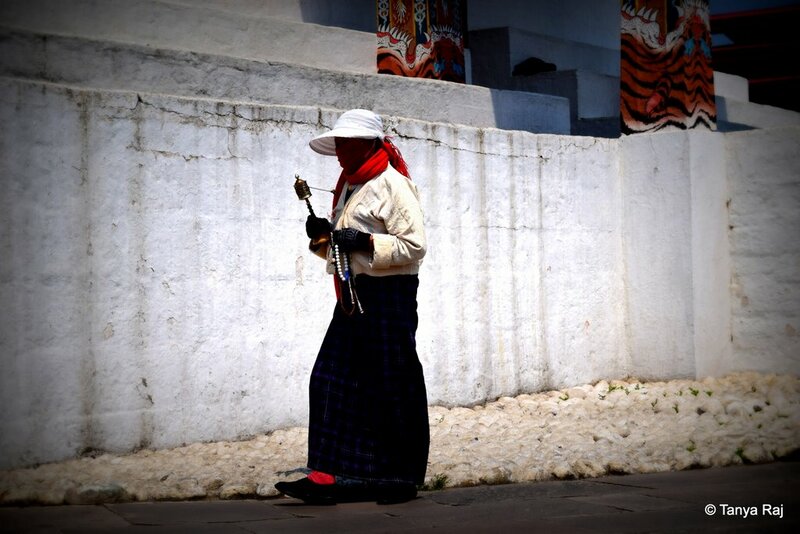 All around the stupa, people perform circumambulation with prayer beads and prayer wheels. Some prostrate and others sit near the 4 large prayer wheels towards the left of the entrance, deep in chants and meditation. 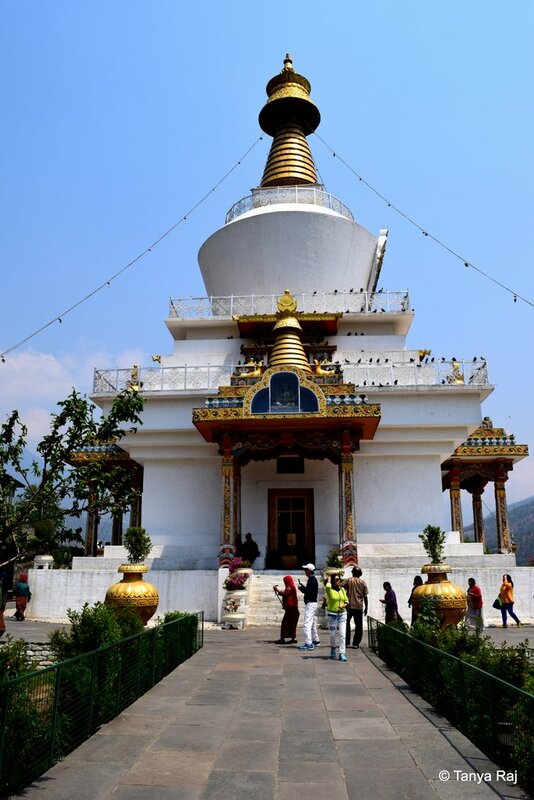 National Memorial Chorten, built in 1974 by Queen Phuntsho Choden Wangchuk, in memory of the Third Druk Gyalpo. 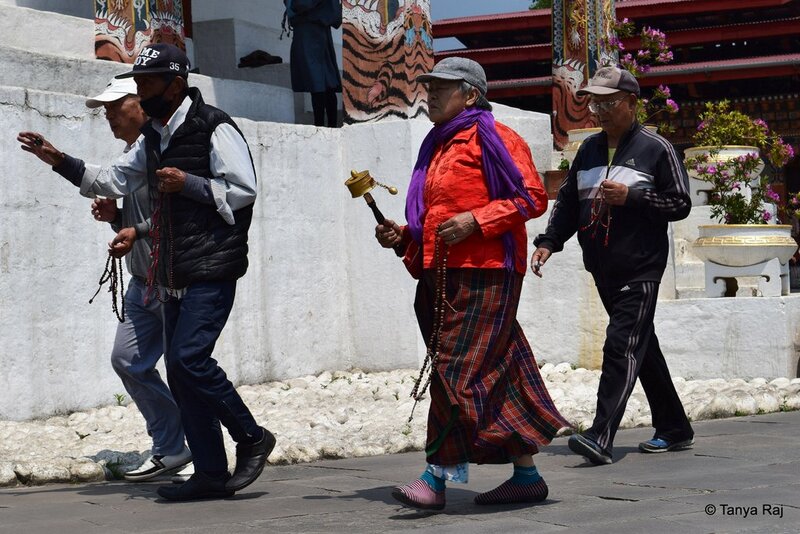 People performing circumambulation with prayer beads and prayer wheels. 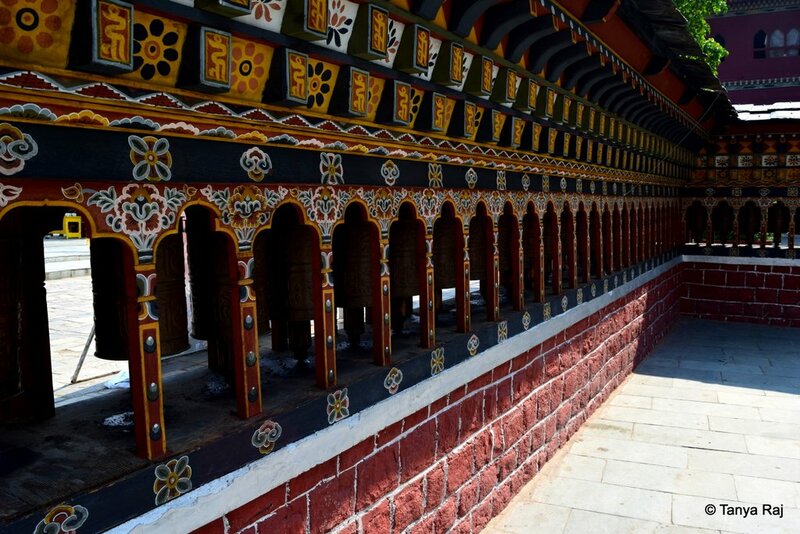 One of the oldest temple in Thimphu, built in the 15th century is Changangkha Lhakhang and is dedicated to the Compassion Buddha – Avalokiteshvara. From the peak of the hillock where this temple is situated, we get a glimpse of the entire Thimphu Valley, including the Royal Complex. 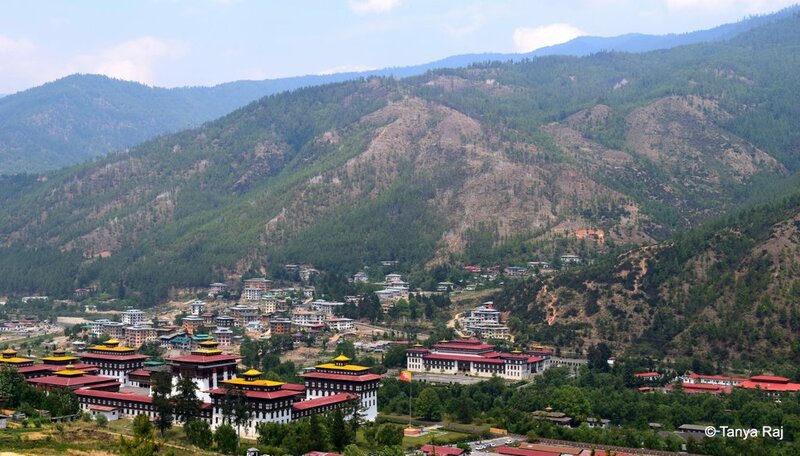 Among lush greenery, we see a large red and golden-roofed structure which is the Thimphu Dzong. Opposite to this stands the parliament building of Bhutan and nestled between these two massive structures is a small thatch-roofed building with yellow prayer flag and a small golden top, which we are told is the Royal residence. Thimphu Valley as seen from Changangkha Lhakhang. The humbleness of the people continued to amaze me and to see this reflected in the King’s palace (which can hardly be called so) left a deeper respect for the citizens of this country. The royal palace is the small hut to the right of the Bhutanese flag. 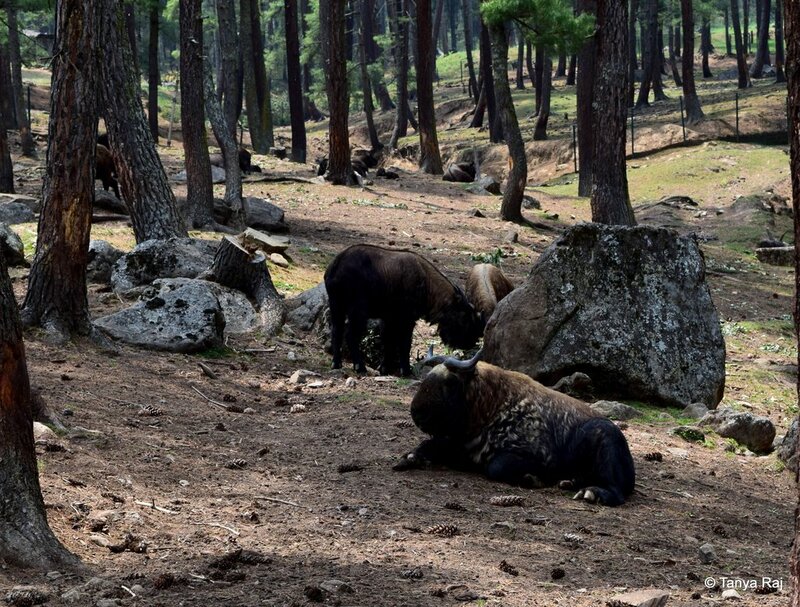 Before leaving the city we also paid a visit to The Phelchey Toenkhyim (Heritage Museum) to see the traditional living quarters of the Bhutanese and the zoo, which houses the National Animal of Bhutan – Takin (Budorcas taxicolor whitei) – classified as vulnerable. This species is a goat-antelope with a stocky body, two-toed hooves, and backward curved large horns. 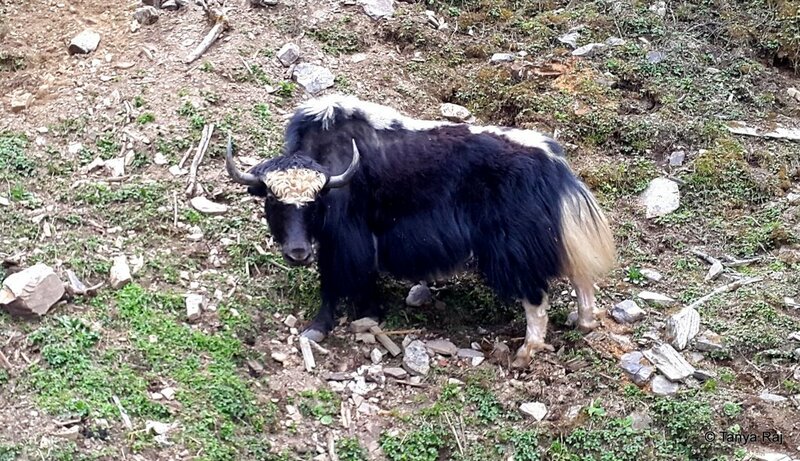 Takin, a goat-antelope is Bhutan’s National Animal and has been classified as a vulnerable species. 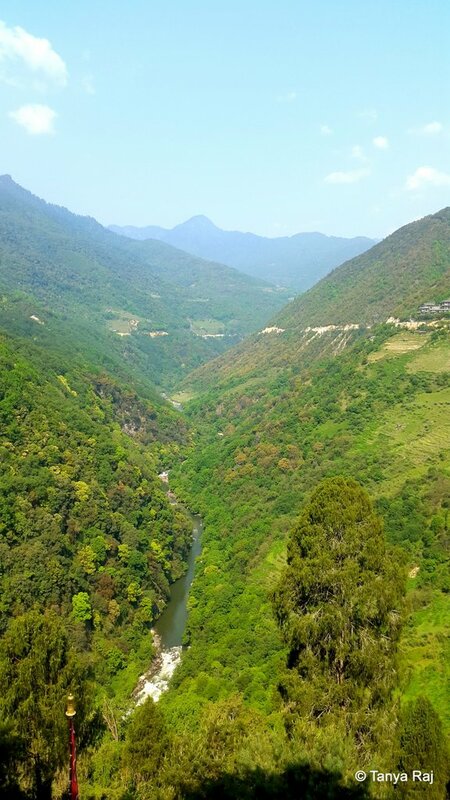 The way from Thimphu to Punakha – the old capital of Bhutan and the royalty’s ancestral place – is lined with mountain sides covered in willow, pomegranate, apple, walnut, conifer, and rhododendron trees. We make a stop at DochuLa Pass – at an elevation of 10,200 feet – with roaring chilly winds. This Pass is home to the Druk Wangyal Chortens – a memorial built by the eldest queen of the fourth king in honour of the slain army men during the 2003 battle against the Assamese insurgents from India. The circular complex consists of 108 stupas in three layers, with 45 chortens on the lower level, 36 chortens on the second level and 27 chortens on the top level built around the main chorten. Druk Wangyal Chortens at Dochu La Pass. 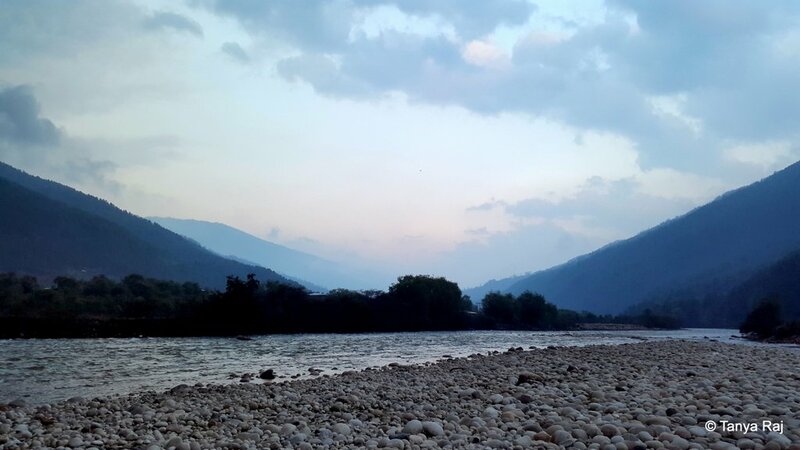 At Punakha, the most ethereal view is that of the Punakha Dzong, meaning ‘the palace of great happiness or bliss’ and it is here where all the royal ancestral functions are performed, including the royal weddings and coronations. The monastery is at the confluence of Rivers Mochu and Pochu – considered to be mother and father. 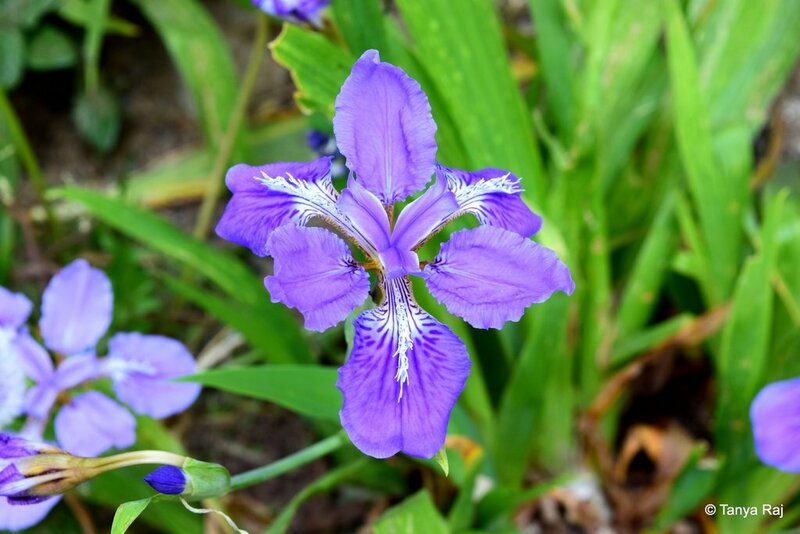 The white façade of the monastery adorned with a red and golden roof paints a pretty picture with the blooming purple Jacaranda trees in the courtyard and connected via an intricately carved wooden bridge across the river. Inside the main temple are large statues of Shakyamuni Buddha and Guru Rinpoche. Tall wooden pillars covered in gold reach the carved and painted wood ceilings. The walls are adorned with paintings of legends from various folklore and deities. A 2.5-feet tall massive butter lamp is lit in front of the altar. All along the floor are small wooden study tables draped in orange cloth. 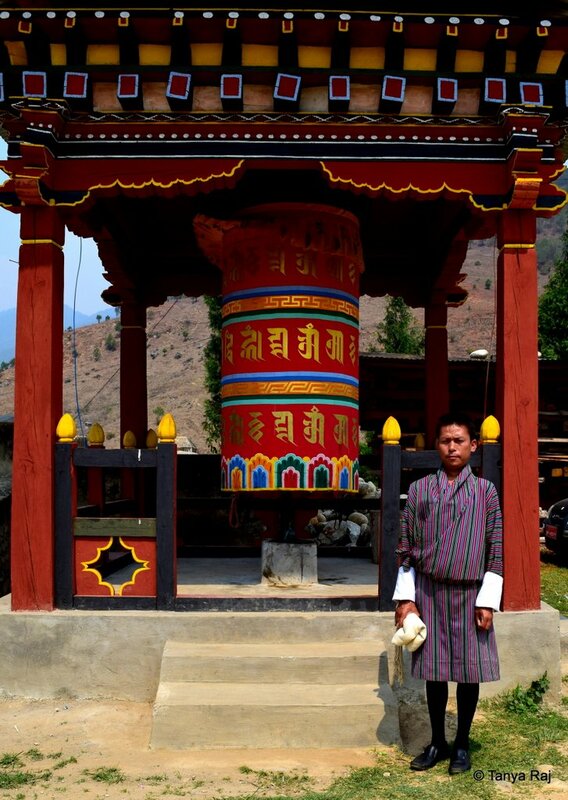 The tingle of the bell from the prayer wheels outside in the courtyard fills the serene silence of the monastery. 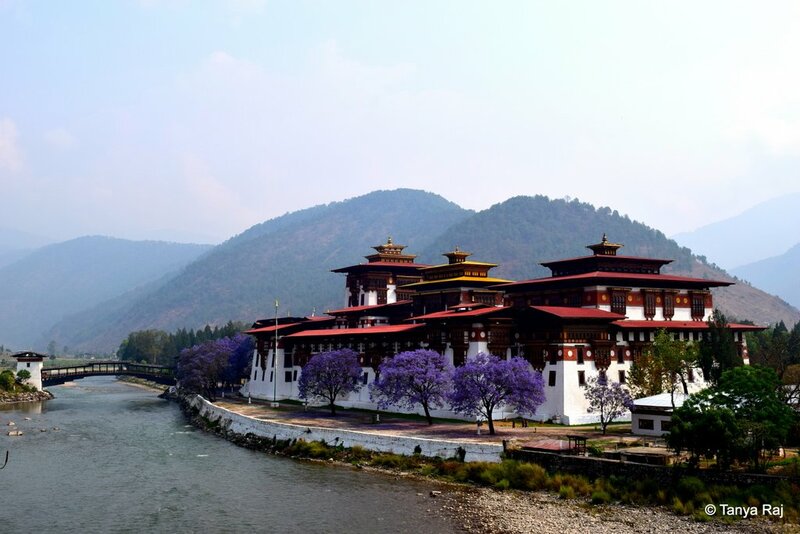 Punakha Dzong in all its glory, with the lined purple Jacaranda trees. Next stop on this trip was the interior regions of Trongsa and Bumthang. Alongside another gushing river and in the midst of thick Persian rug-like mountain slopes covered in every shade of green possible, Bumthang is the valley that I felt most connected to. When we visited the Kurje Lhakhang (Thousand Guru Temple), a study session was in progress at each of the temples. Divided by the level that the young monks are at, the temple reverberated with hoarse yet soothing sounds of chants and drum beats. 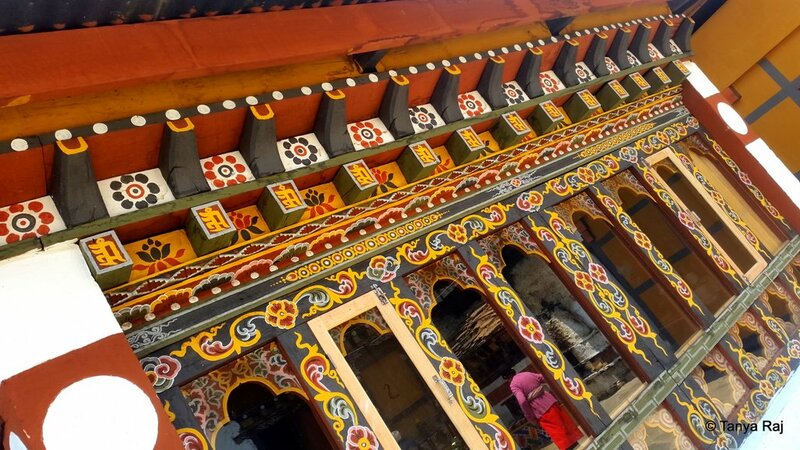 Bumthang, easily the serenest place ever visited. 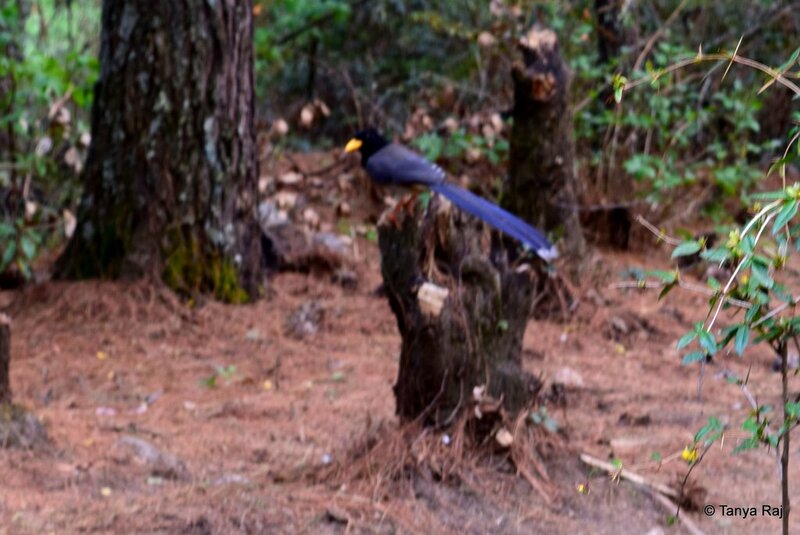 The rains on the previous night made the last day at this beautiful Kingdom of Bhutan a sight to behold. The downpour in the valley had caused the higher mountain tops to be blanketed in snow. It was almost like the country decided to bid us farewell with views of the snow-capped mountains in the distance and clouds hanging on the valleys. 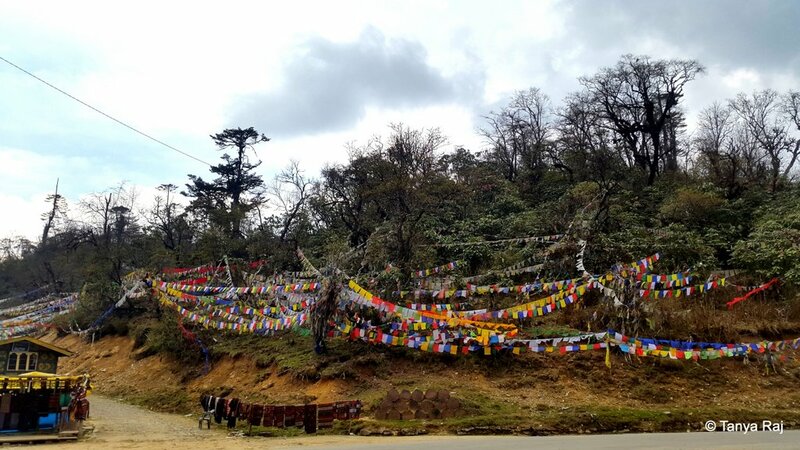 After my return, the way I savour the memories of Bhutan are though an image of hillock mounds covered in colourful prayer flags, flapping and fluttering in the howling gales, carrying with them prayers for all sentient beings. 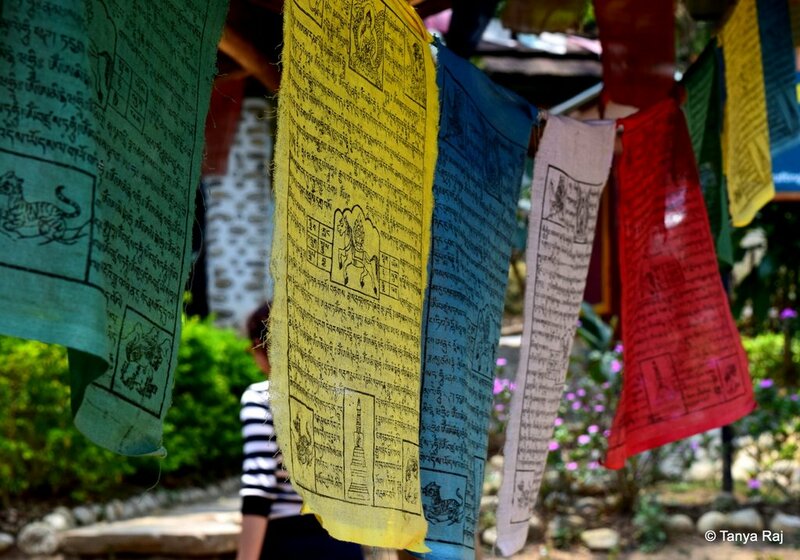 Prayer flags and prayer wheels are in every corner of this country. The vibrant colours of the flags fluttering in the wind are believed to carry the prayers written on them, far and wide. Prayer flags at Pele La Pass. 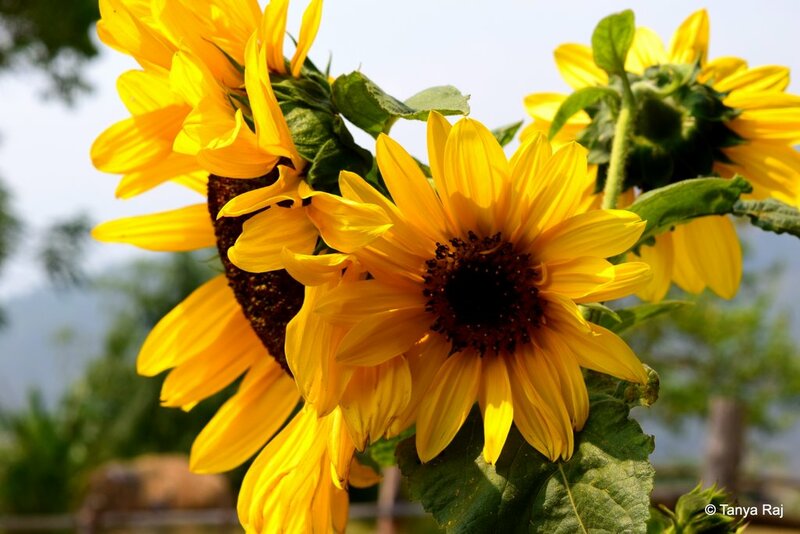 The greetings in Bhutanese for Hello is Kuzoozangpo La, Thank you is Kaadinchhey La, and Bye/Good Wishes is Tashidelek. The traditional dresses worn by men is called a Goh – a knee length, layered wrap around robe. Women wear the Kira and Tigoh, which is held into place with delicate brooches. A Bhutanese man in traditional Goh. Zorangzem, that’s how she introduced herself. This 12th standard girl in Bhutanese traditional dress of Kira and Tigoh, was so soft spoken and so keen to learn about India. 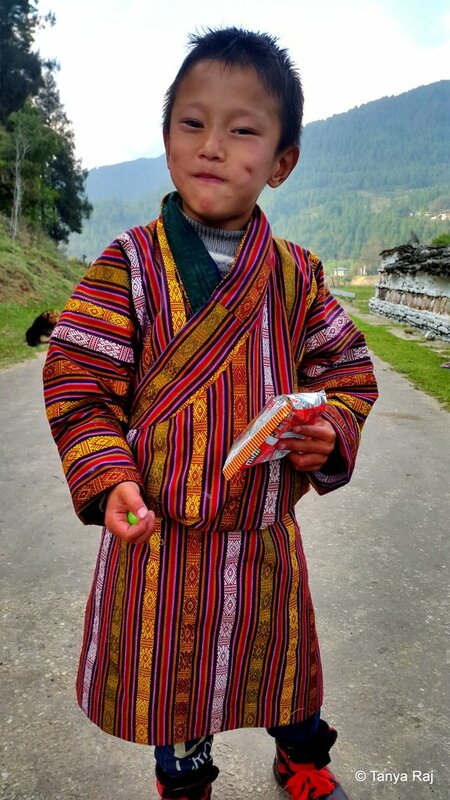 This young boy at Kurje Lhakhang in Bumthang, was the sweetest soul. 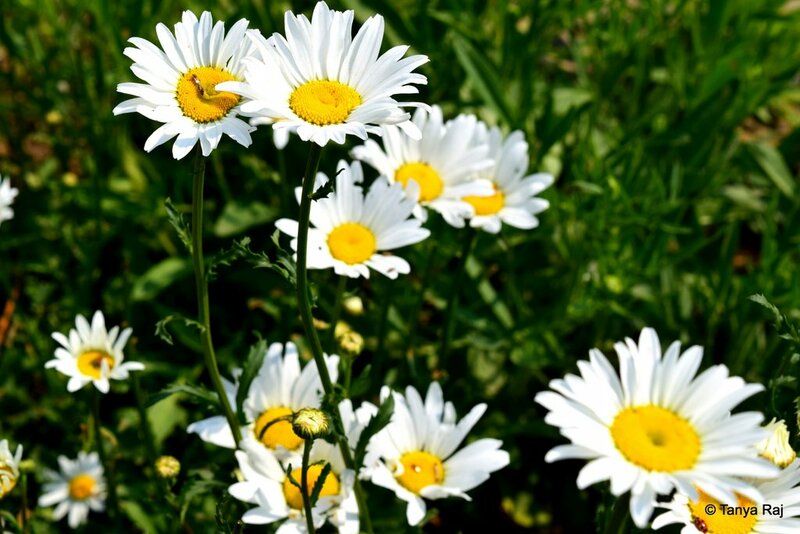 Even though deaf and mute by birth, his enthusiasm for life was overwhelming. Through his sign language, he ensured that everyone in our group had taken his picture and then rechecked the camera to confirm 🙂 We all collectively bought him some candies and savouries from the nearby stalls and the smile on that face, melted our hearts. When in Bhutan, the must try dishes are Ema Datshi (a cheese chilli stew), Kewa Datshi, Pork/Beef Paa. Slaughter and fishing are prohibited in Bhutan and all their food produce (vegetable and meat) is imported from India, due to which the costs of food are slightly higher. Alcohol is tax-free and there is a bar in every second shop in Bhutan – Restaurant & Bar, General Store & Bar and we even came across a Shoe Shop & Bar in Trongsa. No wonder this is the happiest country in the world and measures their growth with Gross National Happiness. 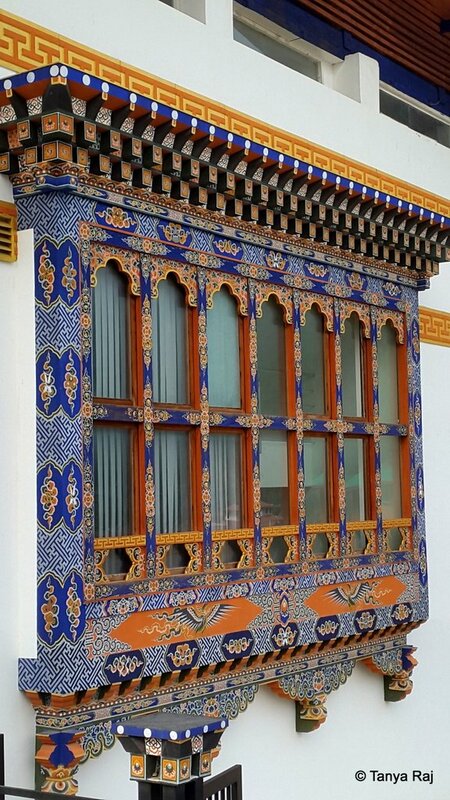 The Bhutanese make an honest effort to preserve their heritage and this can be seen in the houses built even today, with ornate windows, wood carved beams and arches, and traditional décor. An ornate wood carved window. 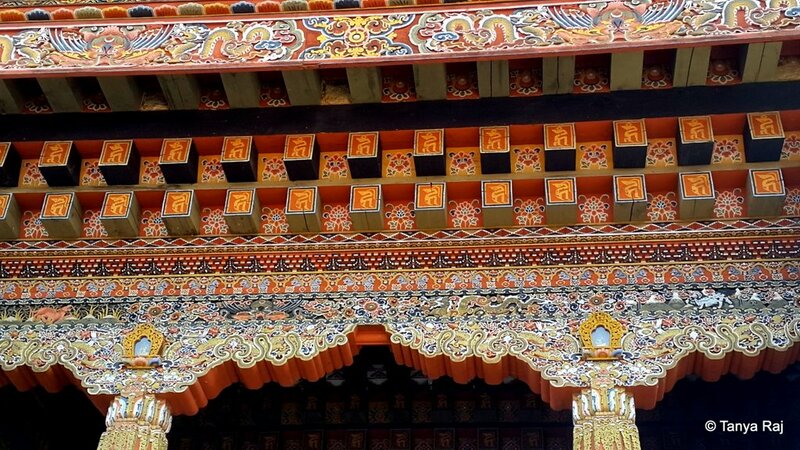 Every monastery in the country has intricately carved and painted wooden arches and beams. Houses are still constructed keeping their heritage alive. There are no traffic lights in Bhutan and even in places like Thimphu, the cars always stop to give way to the pedestrians. We got stuck in a traffic jam that lasted exactly 30 seconds and in my 10 days in the country, I came across just one speed breaker. All throughout the valley, there are amusing cautionary signs like ‘Peep, Peep, Don’t Sleep’, ‘Either Drink Or Drive’, ‘This Is A Highway, Not A Runway’. 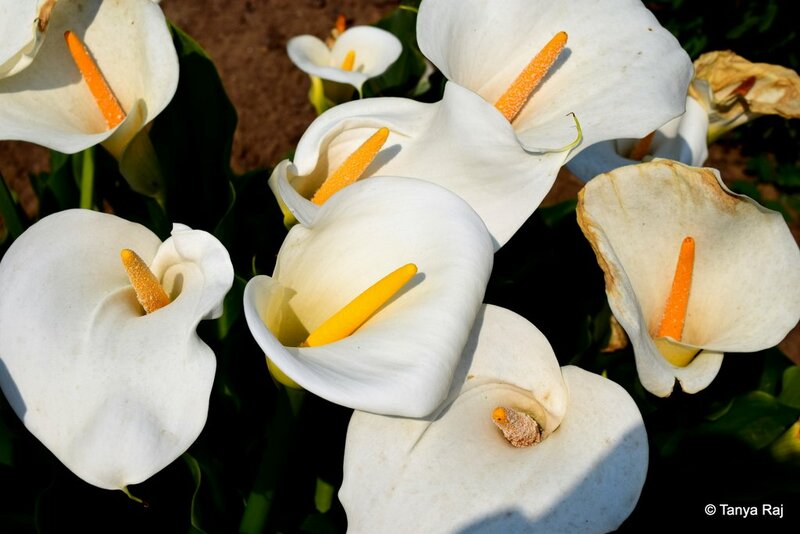 Their life philosophy revolves around their religion and the Bhutanese are very connected to nature. Every person everywhere wears a smile and more than half the population can be seen chanting with prayer beads and prayer wheels at any given point of the day. A woman on the streets of Thimphu, chanting while working through the prayer beads and rotating her prayer wheel. Prayer wheels at a busy roadside in Thimphu. Monkhood still plays a big part in Bhutanese society. 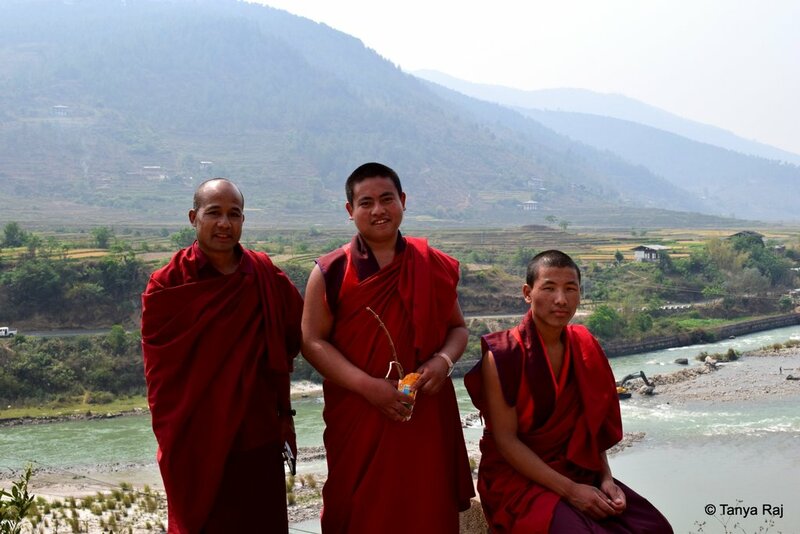 I sat speaking to these 3 monks for a long time. Ones of the either side were shy, but the one in the middle was boisterous and even invited me to his home to show a red flowering tree (an offer I had to courteously decline). The vehicle numbering system is very simplified, with BT meaning taxi, BP meaning private vehicle and BG meaning government vehicle. Phallus and Phallic images and souvenirs can be found all over the country. Bhutanese consider this symbol to be a warder of evil and paint these at the entrance of their homes. A source of amusement for us, but Bhutanese take their symbols with reverence and sacredness. These phallic symbols can be found on most houses, either painted or made out of wood and placed at the entrance door. 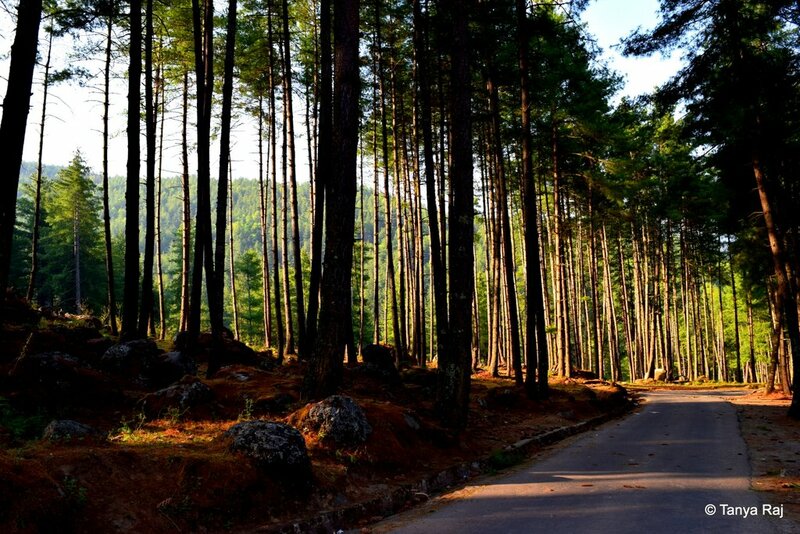 Bhutan looks and sounds divine! !